DUBLIN, April 9, 2019 /PRNewswire/ -- Cell engineering technology business Avectas has completed a US$10 million equity financing with a group of experienced biotechnology investors. The investment round was led by leading pharmaceutical sector investor Seamus Mulligan. Avectas collaborates with leading cell and gene therapy businesses and academic institutions to address their cell engineering challenges using its patented Solupore® technology. 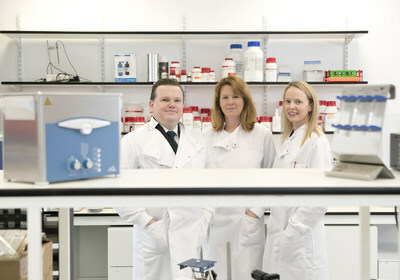 Avectas cofounder and chief Executive Dr Michael Maguire, with cofounder Dr Shirley O'Dea, Chief Scientific Officer and business development Director Dr Gillian Hendy. "The Avectas team is delighted to receive this significant endorsement from a highly experienced group of investors," said Dr. Michael Maguire, co-founder and CEO of Avectas. "This funding, which builds on our recent Horizon 2020 award, provides us with the financial resources to accelerate the development, scale-up and commercialisation of Solupore®." Founded in 2012 as a spin-out from Maynooth University in Ireland by Dr. Michael Maguire and Dr. Shirley O'Dea, Avectas has 24 employees including 13 with doctorate degrees.